Officers from the European Union’s border protection agency, Frontex, lead a migrant as they get in a ferry in the port of Mytilini, Lesbos island , Greece, April 8, 2016. In the face of protests, Greece has resumed deporting migrants to Turkey as part of a controversial European Union-Turkey deal which seeks to stem the flood of migrants in Europe. The deportations come as human rights groups voice alarm. 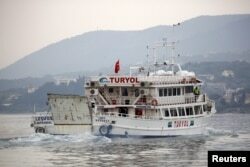 Two vessels carrying more than 100 deportees arrived in the Turkish Aegean port of Dikili Friday, after making the short journey from the Greek island of Lesbos. Most of those deported were Pakistanis. Upon arrival, they were fingerprinted, underwent a health check, and sent to detention centers, where they face the prospect of being sent back to their home countries. On Thursday night, the Turkish parliament ratified a readmission agreement with Pakistan. An officer (L) from European Union border agency Frontex escorts a migrant boarding a Turkish-flagged passenger boat, to be returned to Turkey, on the Greek island of Lesbos, April 8, 2016. Human Rights Watch condemned the deportations. The group's Andrew Stroehlein says Turkey is not an appropriate country for returning refugees. "Turkey cannot even be regarded for refugees. It does not provide effective protection for refugees and has repeatedly pushed asylum seekers back to Syria," he said. A Turkish-flagged passenger boat carrying migrants to be returned to Turkey leaves the port of Mytilene on the Greek island of Lesbos, April 8, 2016. In a recent report, London-based Amnesty International accused Turkish authorities of deporting more than 100 refugees to Syria on a daily basis, a charge Ankara strongly denies. On Monday, nearly 200 refugees were deported to Turkey. The move prompted a surge in asylum requests by migrants, delaying further deportations until now. The European Union has said it hopes the deportations will discourage future migrants from seeking to illegally enter Greece from Turkey, by way of the perilous Aegean Sea. The number of people arriving on the Greek islands this week was reportedly down. The Turkish Coast Guard has stepped up its efforts, but Turkish President Recep Tayyip Erdogan sent a warning to the EU Thursday over the future of the deal. FILE - Turkish President Recep Tayyip Erdogan addresses a meeting of local administrators at his palace in Ankara, March 16, 2016. "There are precise conditions," he says. 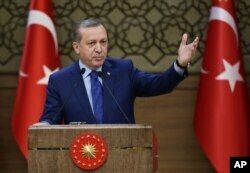 "If the European Union does not take the necessary steps, then Turkey will not implement the agreement. Everything that has been promised under the accord must be put into action by the EU." The EU has committed itself to give more than $6.8 billion in assistance, along with the commitment to accept one refugee from a Turkish Syrian refugee camp in exchange for every deportee sent to Turkey. The regional grouping also is committed to providing visa-free travel to most EU countries for Turks by as early as June. Observers warn such commitments are likely to prove difficult to deliver. FILE - Migrants wait for their registration in front of the Federal Office for Migration and Refugees at Berlin's Spandau district, Germany, Jan. 29, 2016. Meanwhile, Germany has announced that the number of new asylum applications it has received dropped severely from February to March, totaling only 20,000 compared to 60,000 a month earlier. Germany has led the movement to accommodate a near-unprecedented number of refugees flooding in from the east as people try to escape violence and economic insecurity in Africa, South Asia and the Middle East. On Thursday, the Holy See announced that Pope Francis will make a short trip to Lesbos on April 16 to meet with refugees accommodated there. The Vatican said the pope accepted the invitation from the leader of the Christian Orthodox Church, Ecumenical Patriarch Bartholomew, and Greek president Prokopis Pavlopoulos. Bartholomew, as well as Archbishop of Athens and All Greece Jerome II will join the pope in Lesbos. The visit is seen as a symbolic gesture to draw international attention to the plight of refugees, most of them trying to escape the war and poverty in Syria.